With little fanfare, Apple has rolled out some newly-specced MacBook Pros to its online stores. The range refresh has been expected for a while and, although it's not the complete makeover of the line-up that some had predicted, sees each iteration of the much-loved notebook get a little boost courtesy of Intel's Sandy Bridge chips. At the bottom of the scale, the 13-inch MacBook Pro now comes in 2.4GHz and 2.8GHz editions, as opposed to the previous line up of 2.2GHz and 2.4GHz. The 2.4GHz model offers a dual-core Intel Core i5 processor, with 4GB of RAM, 500GB of storage, Intel HD Graphics 300 card and is yours for the princely sum of £999.00. There's a dual-core Intel Core i7 processor powering the 2.8GHz model, with a storage boost to 750GB but the same RAM and graphics packs, with UK pricing at £1,299. 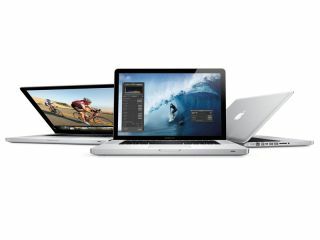 Moving on up, the 15-inch MacBook Pro is available with a 2.2GHz quad-core Intel Core i7 processor, which works in tandem with 4GB RAM, 500GB storage, Intel HD Graphics 3000 and AMD Radeon HD 6750M – those tasty extras are reflected in the UK price of £1,549.00. Also on the quad-core side is the 2.4GHz 15-incher, with the same i7 hardware and Intel HD graphics card, but offers 750GB of storage and an AMD Radeon HD 6770M instead. The step up will set you back an extra £300, with the pricing set at £1,849. The daddy of the bunch is the 17-inch 2.4GHz MacBook Pro. The 2.4GHz quad-core Intel Core i7 comes with the larger screen size, but the same internal workings as the 15-inch equivalent. The MacBook Pro 17-inch 2.4GHz model UK price comes in at £2,099. Of course, all the laptops in the MacBook Pro range come with Mac OS X Lion as standard, and are available to buy now.